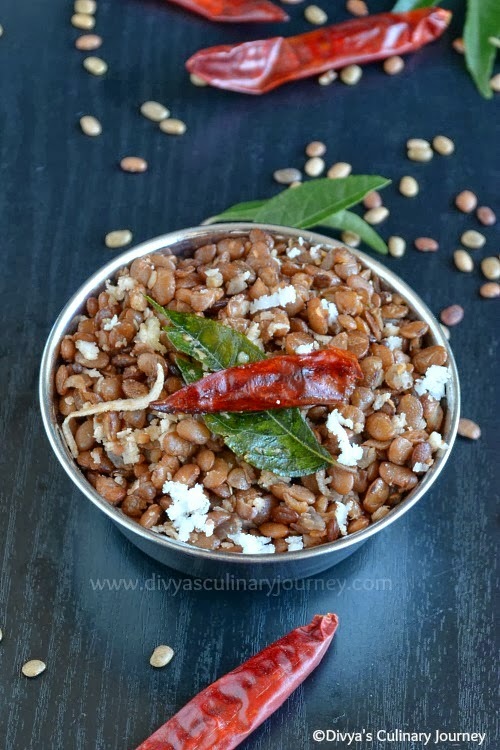 Kollu Sundal is a simple stir fry made with Horse Gram (Kollu). It is very easy to make and is a very healthy snack. Soak Kollu for atleast half and hour and pressure cook it. Drain the excess water (refer notes) and keep the cooked kollu aside. Heat oil in a pan, add mustard seeds and cumin seeds and then add red chillies and fry them for a minute then add chopped onions and curry leaves and fry them and then add a pinch of asafoetida and fry for another minute. Now add the cooked kollu, salt to taste and mix well. If there are any liquid left, saute till it evaporates. Turn off the heat, add grated coconut and mix well and serve warm. Don't throw away the drained kollu water, it can be used to make rasam. Click here for recipe of Kollu Rasam. If you are planning to offer to God, then you can omit onion. Nourishing, Scrumptious Sundal ! ! ! Very healthy sundal and beautiful click too. very healthy sundal. Nice one to try. healthy and tasty sundal...i too like sundals with onion, inviting pics! Wat a nutritious sundal, i love to finish that bowl. Very healthy, nice way of including kollu in the diet.. Healthy delicious Sundal.. Nutrient rich snacks..
such an healthy and delicious looking sundal :) yummmmmm tempting me !! Anyone know where to get Horse Gram in the US? Or a substitute? Very healthy sundal . love to have it anytime. healthy n protien packed sundal....nice.